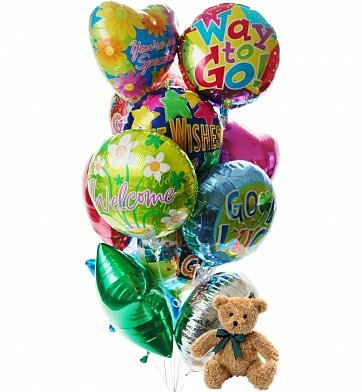 This large and colofrul balloon bouquet is accompanied by a cute plush teddy bear to brighten anyone's day. One dozen Mylar balloons are hand-delivered with a soft and lovable teddy bear. Larger teddy bears, roses, chocolates and more can be added during checkout. During checkout, please be sure to indicate your preferred occasion when you write your gift card. Balloons and teddy bears will vary upon location. Balloons & Bear-12 Mylar is a hand delivered gift. These gifts are delivered by one of our local design centers located throughout the United States and Canada. Same day delivery is available for most gifts when ordered before the cutoff time. The cutoff time for Balloons & Bear-12 Mylar is 2 PM in the recipient's time zone. I ordered same day service from across the country. They were perfect and a huge party hit. I was so relieved to find such a great service that could make my nephew's bday special since at the last minute I could not be there. The lady who helped me was positive, professional, responsive, listening carefully to ensure that my gift was delivered within the same day of the order! Satisfaction with Customer Service and the outcome: 5 Star! Thank you so much! My grandkids live so far and I just can't be there always for their birthday. This Balloon assortment was perfect for my grandson who's turning 7. He was so surprised! Will for sure do this again in future. It was a great surprise for my daughter who was 16 years old. This service was very useful for us. And the balloons were... simply the best!! I ordered this arrangment last minute for my son's birthday and they arrived same day! The balloons were excellent quality and the bear was adorable. This made a for a wonderful surprise! The idea was a last minute. I was able to order and have delivered the same day with no problem! The balloons and bear were very uplifting and said exactly what I wanted them to, "Thank you" to a group of people who had been very supportive of me with a medical issue. I would recommend for anyone, looking for a way to say whatever you want to say, to order and have delivered from this company. It makes people smile when getting something this beautiful. I will always come back and order again. The balloons and bear was delivered promptly and were just as good as I expected. GiftTree sent for us a dozen balloons and a teddy bear. It was a huge hit! They arrived on time, in perfect condition, as promised. thank you for helping us make a 1 year old very happy! I sent this to an adult with a health issue who had received lots of nice tradtional flowers and cookie baskets. He liked them all BUT WHEN THE HUGE BUNCH OF BALLOONS AND THE TEDDY BEAR ARRIVED HE WAS ALL SMILES AND TEARS. His inner child came out and he beamed the rest of the day looking at them. Even with his mom and wife there, the teddy was more comforting. Fabulous same day service and no hidden extras. I'm super pleased with everything. A dozen times "I love you"
The balloon presentation was definitely one to express my love for her! I had it delivered to her job & she was ecstatic!!! If telling her (that special someone) that you love her/him once isn't enough for you, I recommend the bouquet of mylar balloons & teddy bear, so your can tell her/him a dozen times! ;) thank you GiftTree for making my "Just Because" moment extra special & memorable!! Remembered a 4 year olds Birthday at 1:00PM that afternoon. Phoned a Gift Tree Customer Service person and they helped me select the perfect gift and it was delivered before 4:00PM the same day. A good experience. My niece passed her nursing exam and i sent this to her. She absolutely loved it, as well as her family who saw how nicely it arrived!